You know those spotless, clutter-free, amazing looking rooms you see in magazines? That can be your home. Seriously! Fresh Living’s founder, Chantal Moloney created the company out of her combined love and talent for interior decorating and home improvement which paved the way to a career in Home Staging and Interior Redesign. Chantal is an International Staging and Redesign Professional, bringing her talents directly to your door..and she is a Trusted Saskatoon Interior Decorator and Home staging expert! MAXIMUM EFFORT KITCHEN EDITION - Ways to open your kitchen for more convenience! That confused, forlorn expression you see on a “before” victim in an infomercial, before some revolutionary product swoops in to save the day: it’s that expression we all wear when we’re in the middle of meal prep, and find that we’ve run completely out of room. We all have our essentials: coffee maker, sometimes vitamins, the toaster (I’m looking at my kitchen for inspiration with that one), but even still, the team at Fresh Living love to make your lives easier, and we may have just a few tips to help straighten out the most important room in your house! See this space to the left here, in the boxes? That’s underutilized kitchen space. We’ll call it “negative space” for now. 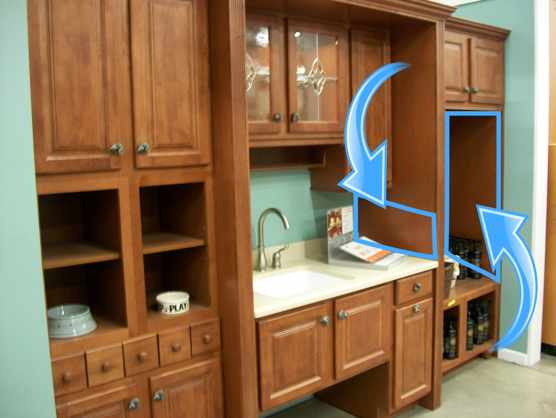 This example shows a few kitchen cabinet-oriented zones, but many kitchens have something similar, where the counter intersects a wall, that’s it. Between the two images we’re using, hopefully, you can see for yourself where extra space can be made available! These areas can be cleanly modified (more on the “clean” part later) – but what to add? Well, if you’re okay making a few holes, a blank wall (or a decorated one) can be made to look very sharp with industrial shelves. Just about every kitchen can benefit from a nice set of stainless steel shelves, and they’re great for those easy-to-move accessories. This may not answer our questions regarding counter space, however – what if we need to work with what we’ve got, there are still plenty of solutions. If you don’t need to use the stove-top right away, you can use that as your cutting board surface, and better yet, a couple of quick cuts later, you can put a hole nearer to the side of a wooden cutting board, put it over the sink, and voila – the scraps can fall on in there for the time being. One less thing to worry about! Earlier one, we mentioned “clean attachments” – that would be Command Strips. You may think of these solely for hanging pictures, but the hooked variety can also be used to, say, organize measuring cups on the inside of a cupboard door, or hang a basket on the cupboard beneath the sink. There are endless ways to improve cupboard space. Lastly, the shelves we’re given don’t always need to be the shelves we’re stuck with. Consider applying shelf options: put shelves inside of shelves – beats the heck out of stacking those cans! We hope this has provided you with some helpful insight, and hopefully some insights into tipping your kitchen in your favour! Stay fresh!